Students and Joukowsky Institute director Sue Alcock search for artifacts in the sifted soil. The recent celebrations for Brown University’s 250th anniversary have highlighted the long and storied history of the university. As we imagine the Brown campus of the future, what questions can we ask of the Brown of the past? How has the physical environment of our campus developed since the early days? How – and where – did Brown students spend their time? And what material traces of the past might still be present, right under our feet, as we go about our daily lives? 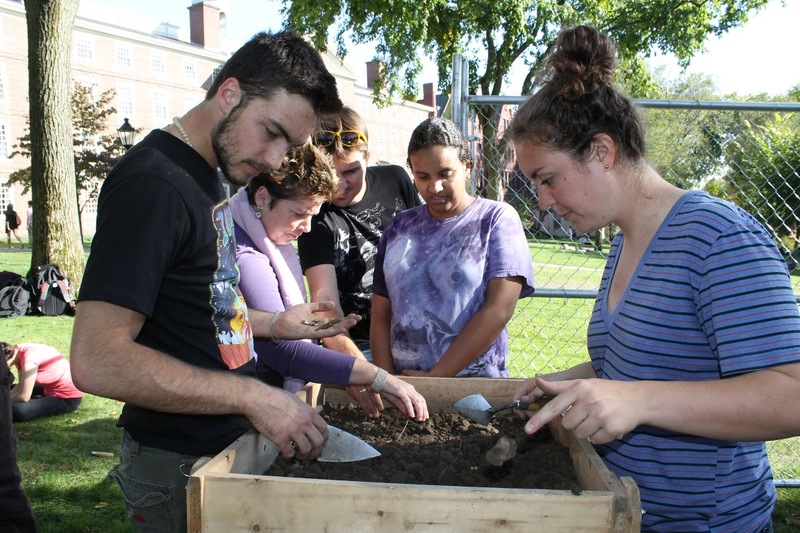 The Archaeology of College Hill addresses these questions directly, through excavations conducted by Brown students at sites in and around Brown’s campus. Beginning in 2015, we’re very happy to be collaborating with the Moses Brown School, to conduct an excavation on Moses Brown’s school grounds (immediately adjacent to Brown University’s campus). In 2015 and 2016, students in the class posted updates to this page as the dig progressed with Site Diary entries, our latest finds, historic research, and anything else they came across. For 2017’s excavation, students’ updates were posted to the class’s Facebook page. In past years, fieldwork by the Joukowsky Institute for Archaeology and the Ancient World has been completed at the First Baptist Church, John Brown House, and Hope College. We were back on campus digging for the 2013 and 2014 field seasons as part of Brown’s 250th celebrations, and opened four larger areas in the Quiet Green – right in front of Manning Hall. We were hoping to learn more about the earlier landscaping of the Green, and to explore the lives of the first presidents of Brown University through a survey and excavation at the location of the first president’s house.